We don’t do Retail Sales. We offer a quality range of Underground Mining Cable leveraging on our extensive industry experience. These control cables are manufactured using high grade raw material in the production process in order to assure industry standards. These Insulated Cables are manufactured in best quality standard to meet international quality standard. Our company is manufacturing, supplying and exporting a much wider comprehension of various kinds of cables in the market since past several years and hence we hold expertise in satisfying our clients with all the best and supreme quality material available in the market. 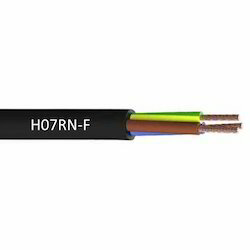 We are making use of one of the most marvelous quality insulating materials for the manufacture of these cables. These insulator cables play a very important role in the field of electrical and mechanical industries where there are provisions of safety electrical wiring. Packaging Details: As we are an Export oriented material Packaging is taken care so that material is not damaged during transit. Material is packed in a rill or roll and is covered with a polythene so that it is not damaged. Being a pioneer in this industry we are capable of manufacturing and supplying a quality array of CSP Cables. With the use of latest technologies and optimum raw material we manufacture these cables. To ensure our products quality we test these on various parameter under the supervision of our professional experts. Our clients can purchase these products from us at affordable price range. ISO 9001, ISI , CE ( EUROPEAN CERTIFIED ) , ANAB , CRISIL , CERTIFIED COMPANY. A full range of High temperature cables . 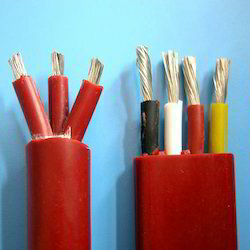 We are the prime manufacturers and exporters of most advanced Neoprene Insulated Cables. The manufacturing unit uses best quality resources and latest tools and machineries to provide these products. The expert individuals analyses the cables for checking of its quality before dispatching. The cables are provided at very reasonable rates to our customers according to their specified requirements. Our company is counted among the very renowned companies in this industry and we are engaged in manufacturing, supplying and exporting a much wider range of world class Rubber Insulated Cables and industrial equipments. These rubber insulated cables are one of the supreme quality materials which we are providing to our clients. These cables are made up of supreme quality conducting material along with one of the sturdiest and heat resistant quality rubber coating. These rubber insulated cables are performing superb in several fields of electronic industries. These rubber insulated cables are available for our clients at a very commercial and convenient range of prices. Port of Dispatch: Ex Factory Vasai. These cables are widely used in applications where high flexibility high temperature is required, our Rubber Insulated Cables allow simple splices andterminations. We use Butyle rubber, Chlorosulphunated polyethylene rubber, Etnylene Propylene rubber, Poly Chloroprene rubber and other synthetic rubbers for insulation of cables. The synthetic rubbers used by us have better heat resistance and oil resistance as compared to natural rubber. Being a pioneer in this industry we are capable of manufacturing and supplying a quality array of EPR Cables. With the use of latest technologies and optimum raw material we manufacture these cables. To ensure our products quality we test these on various parameter under the supervision of our professional experts. Our clients can purchase these products from us at affordable price range. Packaging Details: As we are Export oriented The Packaging materials are taken care so that material is delivered to the client with the same quality. The packing is done in a Rill or Roll form and is covered with a polythene. We BHUWAL CABLES maintain quality standard in manufacturing of our products so that our customers can avail best quality. We are one of the renowned names engaged in offering a quality range of EOT Crane Cables. These cables are manufactured using quality raw materials. These heavy duty elastomer cables are used in generators, heavy machinery, portable power tools and equipment, moving machinery in wet, hot or oily environments. Their flexibility permits use in constricted spaces with sharp and complex bends. They can be made with special abrasion resistant sheaths to withstand rough use in portable equipment. We BHUWAL CABLES are considered to a most trusted named engaged in offering an extensive range of 6.6 Kv Rubber Insulated Cable. Using superior quality of raw materials and contemporary technologies these cables are manufactured. We have a team of well trained laborers who design these cables wires under the guidance of our professional experts. Our clients can avail these from us with various specifications that too at market leading rates.